The following are two accounts of the invasion of Cyprus by Richard I in 1191. The Seljuk Turk under Saladin had recaptured Jerusalem in 1187 and Cyprus’ geographical position placed her on the route of the Crusaders from Western Europe to the Holy Land. The Cypriot ruler, Isaac Comnenos, in return for Saladin’s protection, had promised the Saracens to lend them no assistance; so when in 1191 the ships of Richard, on their way from Messina to join the Third Crusade, were separated by a storm and one of them ran aground off Cyprus, he had no hesitation in seizing and imprisoning the passengers. Unfortunately for him, they included Princess Berengaria of Navarre, Richard’s recently acquired fiancee, and Queen Joanna of Sicily, his sister (and in fact a relative by marriage of Comnenos himself). Richard, who had found shelter on Rhodes, sailed to Cyprus to demand an explanation, defeating an unrepentant Comnenos and taking Limassol castle, where he proceeded to marry Berengaria (who was crowned Queen of England in the same ceremony). Aided by Guy de Lusignan, the deposed King of Jerusalem, Richard then hunted Comnenos down, taking Lefkosha (Nicosia), the mountain castles and Girne (Kyrenia) in the process. 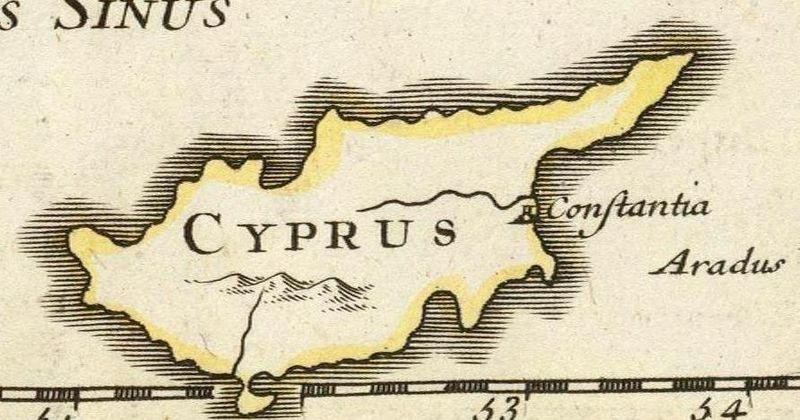 Cyprus was now a British possession and the Lionheart redistributed lands and appointed English-style justices and sheriffs before proceeding to Acre to join the Crusade. Once there, however, a shortage of funds and troops persuaded him to sell the island on to the Knights Templar, the Order formed in the twelfth century to protect pilgrims journeying to Jerusalem after the first Crusade. But Richard’s price (100,000 bezants) meant that the Knights had to impose punitive taxation levels to recoup their investment, and without sufficient forces to subjugate their unruly possession they were soon compelled to beg Richard to take the island back. Richard obliged (though without refunding their down payment), and then handed the troublesome territory to Guy de Lusignan as some compensation for the loss of his Kingdom of Jerusalem. The first account is from Benedict of Peterborough, who tells the story from the English point of view in his Gesta Henrici II et Richard I, while the second account is from a letter by a native Cypriot, a monk named Neophytus, dated to around 1196. In the same month of April the king of England demolished the castle which he had built in the place called Mategriffon, and on Wednesday in Holy Week (April 10, 1191) he and all his army set sail from the port of Messina, on board 150 large ships, and 53 galleys. On Friday a terrible storm came up from the south, about the ninth hour of the day, and scattered his fleet. The king however, with some of his ships, put in to the island of Crete, and thence crossed over to the island of Rhodes. But three large vessels from his fleet were driven by the aforesaid tempest to the island of Cyprus, and, being wrecked and broken up, sank in sight of the port of Limezum. With them went down certain soldiers and attendants of the king’s household, amongst them being master Roger Malus Catulus, the king’s vice­chancellor. The royal seal was found hung round his neck. Isaac the Emperor of Cyprus seized the chattels of those who were drowned, and robbed of their money all who escaped from the shipwreck. Moreover, in the fury of his savagery, worse than any beast of prey, he refused permission to enter the port to a galliot which had been driven thither by the wind, and which carried the Queen of Sicily, and the daughter of the king of Navarre. When news of this was brought to the king he hastened to their rescue, with many galleys and a great following of ships, and found the ladies outside the port of Limeszun, exposed to the winds and sea. Then in great wrath he sent messengers to the Emperor of Cyprus, once, twice, and yet a third time, making his request with mild entreaty, that his fellow pilgrims, whom the Emperor was keeping in durance, should be restored to him together with their belongings. To whom the Emperor made answer with proud words, refusing to surrender either the prisoners or their belongings, and saying that he had no fear of the king of England or of his threats. Meanwhile the Emperor had occupied the shore in every direction with his men. Many of them were armed, but still more had no arms at all. But the king of England and his men, as soon as they had armed themselves, disembarked from their large ships into their boats and galleys, and came to land with a rush. The king, accompanied by his bowmen, was first to land, the rest followed, and as soon as they reached the shore one and all flung themselves upon the Emperor and his Griffons. The arrows fell like rain upon the grass. After a prolonged conflict the Emperor, having lost a multitude of his men, fled, and his entire host with him. The king of England, exulting in his great victory, pursued, and made a very great slaughter of all who resisted, and, had not night fallen soon, he would have taken the Emperor himself that day, either alive or dead. The king and his men however knew not the roads and mountain paths by which the Emperor and his followers made their escape, and would not pursue them further but returned with a great prey both of men and animals to the town of Limezun, whence the Griffons and Herminians (Greeks and Armenians) had fled, leaving it empty. On the same day (May 6) the king of Navarre’s daughter and the Queen of Sicily, who was sister to the king of England, entered the port of Limezun, attended by the king’s fleet. The Emperor, having rallied round him his men, who were scattered amid the thickets in the mountain valleys, pitched his camp the same night on the banks of a river about five miles distant from the town of Limezun, declaring with an oath that he would fight the king of England on the morrow. The report whereof was brought by scouts to the king, who long before daylight armed himself and his men for battle, and advancing silently came upon the Emperor’s men, whom he found asleep. Then, with a loud and terrifying shout, he charged into their tents, and they, suddenly awakened from sleep, were as dead men, knowing not what to do, nor whither to fly. The Emperor himself escaped with a few men, naked, and leaving behind him his treasure, his horses, his armour, his magnificent tents, and his imperial standard wrought all over with gold, which the king of England at once dedicated to the blessed Edmund, King and Martyr of glorious memory. On the morrow many counts and barons of the kingdom came to the king of England, and became his men, swearing fealty to him against the Emperor and all men, and gave him hostages. Three days later Guy, king of Jerusalem, Gaufrid of Lezinant his brother, Anfrid of Turun, Raimund [Boemmund III.] Prince of Antioch, Boemund [Raymond III.] his son, count of Tripoli, and Leo, brother [cousin] of Rupin of the mountain, came to meet the king of England in Cyprus and there they became his men, and swore him fealty against all men. On the same day the Emperor of Cyprus, seeing that all his people were deserting him, sent ambassadors to the king of England, to sue for mercy, and offered to make peace on these conditions, namely, that he should give the king of England 20,000 marks of gold, by way of compensation for the money taken from the bodies of those who had perished in the shipwreck, and surrender the persons and goods of the survivors; also, that he should himself accompany the king to Syria, and remain there in the service of God, together with a hundred men-at-arms, and four hundred Turcople horsemen, as long as the king stayed there; also, that he should deliver his only daughter and heiress into the king’s hand to be married by him to whomsoever he would, and with her his Empire; furthermore, that he should surrender the castles of his realm to the king, as a pledge for the steadfast observance of the treaty. As he had spoken, so did he. The galleys he divided into two squadrons, handing one over to Robert of Tornham, and retaining the other under his own command. Then they embarked, and setting sail, the king in one direction, and Robert in the other, sailed round the whole island, seizing all the ships and galleys they found in their course. The Griffons and Herminians, who had been charged with the defence of the Emperor’s towns and castles and stores, seeing such a. host of armed men and ships coning, fled into the mountains, leaving them without a guard. So the king and Robert took all the castles, towns and ports which they found empty, and having garrisoned and provisioned them and left guard ships, returned to Limeszun; on the other hand, the king of Jerusalem and his forces were able to achieve but little in the course of their expedition. On the 12th day of May, being Sunday, and the feast of Saints Nereus, Achilleus and Pancratius, Richard, king of England, took to himself in marriage Berengaria, daughter of the king of Navarre. Nicolas, the king’s chaplain, performed the office of this sacrament. On the same day the king caused his wife to be crowned Queen of England in the city of Limeszun by John, bishop of Evreux, in the presence of the archbishops of Apamea and Auch, the bishop of Bayonne, and many others. After this the king of England, hearing that the Emperor’s daughter was in a very strong castle called Cherin, went thither with his army. On his approach towards the fortress the Emperor’s daughter came to meet him, and falling at his feet, did him obeisance, putting herself and the castle at his mercy. Then was delivered to him the exceeding strong castle called Buffevent, and after that all the towns and fortresses of the Empire were surrendered. The wretched Emperor lay in hiding in a certain strongly fortified abbey called Cape Saint Andrea. Hearing that the king was at hand, he went out to meet him, and falling at his feet prayed the king to spare him in life and limb, saying never a word about the realm, for as much as he knew that all was now in the king’s hand and power. This only he begged from the king, that he would not suffer him to be bound in fetters of iron. The king heard his prayer, and put him in charge of Ralph, son of Godfrey, his chamberlain, to watch and ward, giving word that fetters of gold and silver should be made, to bind the Emperor’s hands and feet withal, and that he should be made fast in them. All these things befell in Cyprus in the month of June, on the first day of the month, being the vigil of Whitsunday. All things having been ordered for the security of the king’s Empire, and garrisons placed in the towns and castles, the king put in charge of Cyprus Richard of Camville and Robert of Tornham. On the same day (June 1, 1191) Berengaria, Queen of England, the Queen of Sicily, and the daughter of the Emperor of Cyprus, accompanied by the greater part of the king’s fleet, came to the camp before Acre. On the same day also died Philip, Count of Flanders, in the siege of Acre. On Wednesday after Whitsunday the king of England set forth from the island of Cyprus in his galleys, taking with him the king of Jerusalem, the Prince of Antioch, the Count of Tripoli, and the rest of the princes who had come to him in Cyprus. He also sent Ralph son of Godfrey with the Emperor of Cyprus to Tripoli. But before the king’s departure from Cyprus the counts and barons and all the men of the island delivered up to the king the half of all their possessions in return for the laws and institutes which they had in the time of Manuel, Emperor of Constantinople. These the king granted to them, confirming the grant by a charter. In the same month of June Richard of Camville, whom the king had appointed one of his justiciaries in Cyprus, fell sick, and without obtaining the king’s leave, came to the camp before Acre, where he died. After his death the Griffons and Herminians, who had not yet accepted the king’s peace, set up for themselves a new Emperor in the person of a monk, who was kinsman of the Emperor Isaac. Then Robert of Tornham, who was now sole justiciary of the king in Cyprus, assembled a great army and joined battle with the new Emperor, whose host he put to flight. The Emperor himself he took prisoner and hanged upon a gallows. In the same month died Ralph son of Godfrey, to whose charge had been committed the Emperor of Cyprus. The king then put the Emperor in ward with Gamier of Nablous, the Grand Master of the Hospital. A cloud veils the sun, and a mist mountains and hills, and these for a while shut out the warmth and bright ray of the sun; and us too, for now twelve years, a cloud and mist, of successive calamities which have befallen our country, wrap round. For Jerusalem having fallen under the rule of the godless Saladin, and Cyprus under that of Isaac Comnenus, fights thenceforth and wars, tumult and turbulence, plunder and dread events, covered the land in which these men ruled, worse than cloud and mist. For lo! the life-giving sepulchre of our Lord, and the other holy places, for our sins have been given to the Mudslim dogs, and at this great calamity every God-loving soul weeps: as it is written (Psalm xlvi. 6), “the nations raged, the kingdoms were moved,” the sovereigns of Germany and England, and of nearly every nation are moved, I say, on behalf of Jerusalem, and have done nothing. For Providence was not well pleased to thrust out dogs, and to bring wolves in their room. And now for twelve years the waves swell up even worse: and he, our beloved spiritual son, to whom forsooth we write these things, enduring not to see and to hear the horrors, and partly to suffer them, after many questionings and contrivances, by a divine impulse fled from their bloodstained hands with all his people, and having approached Angelus, the sovereign of Constantinople, was honourably welcomed by him, and from him received the dignity of ” Augustus.” And I, in fulfillment of my promise, lo! by the grace of God, write the rest as I promised, setting forth to those who may read these our present difficulties. Which difficulties, when they shall end, no one among men knoweth, but He only who rebuketh the sea and the winds, and they are still. Strange things and unheard of have befallen this land, and such that all its rich men have forgotten their wealth, their fine dwellings, families, servants, slaves, their many flocks, herds, swine, cattle of all kinds, grain bearing fields, fertile vineyards and variegated gardens, and with great care and secrecy have sailed away to foreign lands, and to the queen of cities. And those who could not fly – who is fit to set forth the tragedy of their sufferings? The searches, the public prisons, the exaction of money squeezed from them, thousands upon thousands! But these, by the just judgment of God, were allowed to befall us on account of the burthen of our sins that we might be humbled, and perchance be deemed worthy of forgiveness. England is a country beyond Romania on the north, out of which a cloud of English with their sovereign, embarking together on large vessels called smacks, sailed towards Jerusalem. For at that time the monarch of the Germans, it is said with 900,000 soldiers, was making his way to Jerusalem; and passing by the land of Iconium, and coming through the eastern countries, his troops perished from the length of the journey, and from hunger and thirst. And their sovereign, as he was riding, was drowned in some river. But the English king, the wretch, lauded in Cyprus, and found it a nursing mother: had it not been so, he too perchance would have suffered the fate of the German. But how Cyprus was taken, this too I will briefly relate. When it became necessary that the most pious sovereign Manuel Comnenus, of happy memory, should send a garrison to the royal strongholds in Armenia, he sent one of his kin, quite a youth, Isaac by name, who after guarding the fortresses for some years engaged in war with the Armenians. He was taken captive by them and sold to the Latins. They held him for many years bound with chains, for his uncle, the Emperor Manuel, was dead, leaving his realm to his son Alexius, also a child. Whereupon his uncle Andronicus, who reigned with him, killed the boy and seized the kingdom. But at the entreaty of the assembly he sent a very large ransom, and bought the said Isaac out of the hands of the Latins. Isaac came to Cyprus, took it, and was proclaimed king. He ruled over it for seven years, and not only utterly despoiled the land, and perpetually harassed the lives of its rich men, but every day he hounded and oppressed its nobles, so that all lived in distress, and sought how by any means they might protect themselves against him. While things were so, lo, the Englishman lands in Cyprus, and forthwith all ran unto him! Then the king, abandoned by his people, gave himself also unto the hands of the English. Him the English king bound in irons, and having seized his vast treasures, and grievously wasted the land, sailed away to Jerusalem, leaving behind him ships to strip the country and to follow him. But king Isaac of Cyprus he shut up in chains in a castle called Marcappus. The wicked wretch achieved nought against his fellow wretch Saladin, but achieved this only, that he sold our country to the Latins for two hundred thousand pounds of gold. Whereon great was the wailing, and unbearable the smoke, as was said before, which came from the north. He that would tell of them at length, the time shall fail him. These texts are from Exercpta Cyrpia: Materials for a History of Cyprus and an Attempt at a Bibliography of Cyprus, edited by Claude D. Cobham (Cambridge, 1908). This entry was posted in Primary Sources and tagged 12C, Cyprus, Richard I, Third Crusade. Bookmark the permalink.